We typically sell kids in the spring and occasionally have a milking doe or buck available at various times during the year. We will post information on our web site and on our facebook page when goats are available. View our breeding chart here. There are currently no goats for sale, but we are taking reservations for 2016 kids. Unfortunately our Alpine buck was not fertile early in the breeding season and we had a number of does cycle agin late in the year. This year the bulk of our herd was bred to a registered LaMancha buck (pedigree link available soon) and will kid in June. No buck kids will be available but we will have recorded grade Experimental doelings available for $200 each. We accept check, money order, cash, and Paypal for deposits. Email us or use our contact form to reserve! We only sell buck kids out of exceptional first fresheners. We will accept deposits for buck kids from first fresheners but we will determine sale-ability once the dam has freshened and we have evaluated her udder and production. These does are no longer in our herd, but have had a significant impact in many ways. These bucks are no longer in our herd, but have had a significant impact in many ways. A deposit of $100 will reserve an unborn kid from a specific breeding, all sales are on a first deposit, first served basis. If the kid of your choice is not born, or is not offered for sale, your deposit will be refunded or transferred to another kid of your choice. To avoid disappointment, please make a second choice if possible. While the majority of our kid crop will be offered for sale, we reserve the right to retain any kid as a herd replacement, and we will not sell any kid with a structural deformity. A deposit of $100 will hold a kid that is already born, or an adult, for 30 days, unless we have made private pickup arrangements with the purchaser. The balance of your purchase must be paid in full before the animal leaves our farm. Kid prices do not include shipping. We will make every effort to keep these costs as low as possible. You are welcome and encouraged to pick up your animal at the farm and see its relatives. We would love to show you our farm and goats! Kids must be picked up by age two months unless we have made other private arrangements. 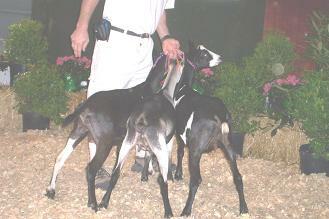 We are usually able to deliver goats to shows we attend. If animals are being held for some time there may be a small board/delivery charge. To keep herd numbers down, we will also have a few milking does available in the spring. If you are interested in a particular doe do not hesitate to inquire, and we will inform you of prices and availability once those decisions have been made. Usually we only sell doe kids out of first fresheners. If you are interested in a buck out of a first freshener let us know and we will determine salability once we have evaluated the dam's udder. We stand behind our animals and guarantee them to be fertile. If this is not the case replacement will be made to provide complete satisfaction.